"It is rumoured in the great halls of eternal mind, that there are those of the earth’s children who are now re-awakening to the voice of the recondite race of reality known as The Speakers. 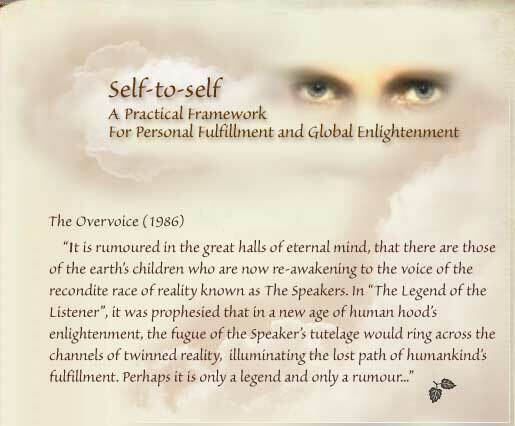 In "The Legend of the Listener", it was prophesied that in a new age of human hood’s enlightenment, the fugue of the Speaker’s tutelage would ring across the channels of twinned reality, illuminating the lost path of humankind’s fulfillment. Perhaps it is only a legend and only a rumour..."
This week's addition is Part Three of an early "Speakers" piece entitled "Foundations, Walls and Windows of Opportunity". in order, click the arrow buttons at the bottom of each page. The verse "Evolvement" is the first in our poetry collection.